Experience the best natural sights, real life of nomads and all main monuments in one week time with an intensive route trips. Travelling along the famous Pamir Highway, the second highest highway in the world running between Osh in Kyrgyzstan to Khorog in Tajikistan and winding its way through the Parmir Mountains, their 7,000m peaks earning this artery the title ‘roof of the world’. As we travel through remote communities scattered along the Highway and beyond, we stay in welcoming homestays, immerse ourselves in a cacophony of cultures, with each village speaking in a unique dialect. This journey through some of the most exquisite elevated landscapes in the world is more about following in the tracks of ancient traders and explorers than those of modern day tourists, with isolated communities that still see very few foreign visitors, and traditions that haven’t changed for generations. Meeting at your hotel and we leave from Osh to Sary Mogol. En route we cross the Taldyk Pass (3554m) and enjoy some beautiful views — we may catch a glimpse of Peak Lenin, at 7134m the second highest mountain in Central Asia.We will stop for a lunch in between. Once we pass the village of Sary Tash, the natural scenery of Pamir Alay range is spectacular. Arrival Sary-Mogol village , village is close to see Lenin Peak (7134m). This small town bestrides the Murghab River at an altitude of 3,650 m. Younghusband visited it in 1890 and wrote «It is a dreary, desolate spot… with a certain amount of grassy pasture and a few scrubby bushes by the river, but surrounded by barren hills, and bitterly cold. How these Russian soldiers can support existence there is a marvel…shut up in dreary quarters, with nothing whatever to do — week after week, month after month passing by in dull monotony….» Over a century later, nothing much has changed. We anticipate arriving in Murghab in Lunch time. Murghab (3670 m) itself has few attractions, but it will serve as our base for a one night as we explore the area a little. The 7546 m – high Chinese peak of Muztag Ata is visible to the northeast of town, 135 km away in a direct line. 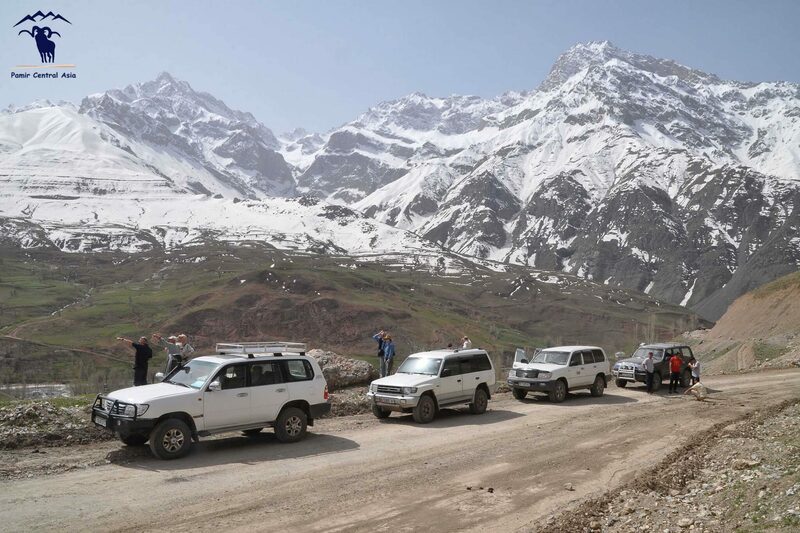 Today we will drive to Langar en route visit Bulun Kul and Yashil Kul. The most beautiful lakes of the Pamirs are Yashil Kul and Bulunkul (Blue lakes), stretched on the altitude of 3 700 meters above sea level, are situated in the Murghab district. Today we will spend a night near them. The color of water in Bulunkul is a subtle inter-play of violet and dark-blue in the sunlight. Species of fish like are found in abundance in the lake. There is the opportunity to see yaks, a unique species of domestic animals, sharing features of cow and sheep, traditionally used as a beast of burden apart from giving milk and meat products.Then continue our drive to Langano via the Kargushi Pass (4344 meters). On this journey we leave behind the lush valleys of the M41 and enter to Wakhan Valley landscape that is rocky, mostly barren but nevertheless dramatic. This is the Pamir Highway we have anticipated, with the route between Khorog and Osh completed in 1931 across a Tibetan-plateau style high altitude terrain. The Wakhan Valley (also pronounced Vakhan) is a majestic alpine valley in the Badakhshan region of Afghanistan and Tajikistan (the “Wakhan Corridor” refers to the part of the valley in Afghanistan). It is located in the Pamir Mountains in Central Asia. Its upper reaches consist of two wide, hilly plains surrounded by alpine peaks, beginning near the Chinese border in one of the most remote regions of the world. Further down, where the Pamir and Wakhan rivers join to form the Pyanj River, the valley narrows, finally becoming a severe canyon with roaring river rapids at its end in Ishkashem. Its muddy rivers are fed by water from huge glaciers on some of the highest mountains on the planet, fantastic views of which are visible throughout the area. Langar – Ishkashim a number of stops will be made throughout the day. Drive to Vrang a stroll through the village will bring you to a number of caves dug by Buddhists who inhabited the area at one time. In addition there are the remains of a number of fire – worshipping platforms and Buddha stuper. At Yamg, visit a quirky museum of Sufi Muborak-Kadam, a local Sufi scholar. After short driving you will be to see the Kakhka kala Fortress which dates from the 3rd C. Yamchun fortress or Zulkumor Fort is located on ridge overlooking the valley and river below. Further up the hillside there is the hot spring at Bibi Fatima. The water at Bibi Fatima is crystal clear. It is possible to take a natural stream bath in a rocky cave. Your next stop will be at the Abrashim Fortress. It was built to guard this branch of the Silk Road from Chinese and Afghan Invaders. Afternoon you will arrive to Ishkashim the center of Wakhan valley, which stands at the mouth of wakhan River valley. This is where the 19th C Great Game ended; When Britan and Russian signed a treaty adding a strip of the Wakhan valley to Afghanistan to create a neutral buffer zone between their two empires. As you enter the Wakhan, there are amazing views of the Pamirs to the right and the Hindu Kush to the left. We will stop at Garmchasma hot springs for an (optional) dip in the natural hot springs. We pass regional gem mines mentioned by Marco Polo in his descriptions of what he called the ‘Mt Shugnon region’. The most famous mine is Koh-i-Lal ruby mine which is visible from the road. Arrival to Khorog, we stay in relative luxury hotel tonight, having reached the capital of the Gorno-Badakshan Autonomous Oblast (GBAO). The capital of Gorno-Badakshan Autonomous Oblast, Khorog is a small town that at various times has been under the control of the Russia, the Emirate of Bukhara and Afghanistan. The Russians built a fort here in the Soviet era, with Khorog being in a highly strategic location on the border with Afghanistan, but today it languishes and is one of the least developed parts of the country, with the Aga Khan Foundation contributing to the bulk of the local economy. It holds the distinction of being home the second highest botanical garden in the world, at 3900m. Today we set off in Kalaikhumb, driving through beautiful scenery and interesting villages en route.This area is a little more conservative, and we see many men with beards, and women wearing traditional dress. The road joins the river Pianj, which in turn forms the border with Afghanistan. The contrast across the river valley is telling, Tajikistan is undoubtedly a poor country, but in general the roads are sealed and buildings are connected with electricity. The situation barely 100m away is even starker, and it is as if the river represents not just a physical divide, but also a step back in time. After breakfast drive to Dushanbe the capital of Tajikistan. Until 1961 it was called Stalinabad. Autumn is considered by most to the best season of the year since there is warm, dry weather and a rich harvest of fruit, vegetables, cotton and other crops. The first impression of Dushanbe is of a relaxed, green and spacious city. The city centre retains the ambience intended by the original city planners in the 1920s — wide, tree-lined boulevards with elegant buildings painted in white and pastel colors. The tall trees (planted eighty years ago when the city was laid out) provide ample shade and make it cool and pleasant to walk around even during the hot summer. We will cross the Shurabad Pass (2200m high) It was a map of all historical places and sights of Tajikistan. Meals as listed: 6 Breakfasts, 7 Lunches, 7 Dinners.